Poison hemlock is native to North Africa and Eurasia including Greece. It's the plant behind Socrates' famous last words, "I drank what?" Or, maybe it was, "don't try this at home." Just kidding. In fact, it was the plant used to poison Socrates and thanks to Plato’s Phaedo, his actual last words are known and involved sacrificing a rooster to Asclepius. Their exact meaning has been debated by scholars for centuries … which is why I like my versions better. The roots are more toxic than the leaves and stems; however, all parts of the poison hemlock plant including the seeds should be considered dangerous. The toxins cannot seep through our skin. Poison hemlock toxins must be ingested or enter through the eyes, cuts, or other openings to cause poisoning. Another possible mode of entry is through inhalation which is why plants should never be burned. The structural formula for coniine is very similar to nicotine; the two are chemical cousins. It’s reasonable to assume that coniine can be carried by smoke into lungs just like nicotine. However, coniine is much more toxic compared to nicotine. 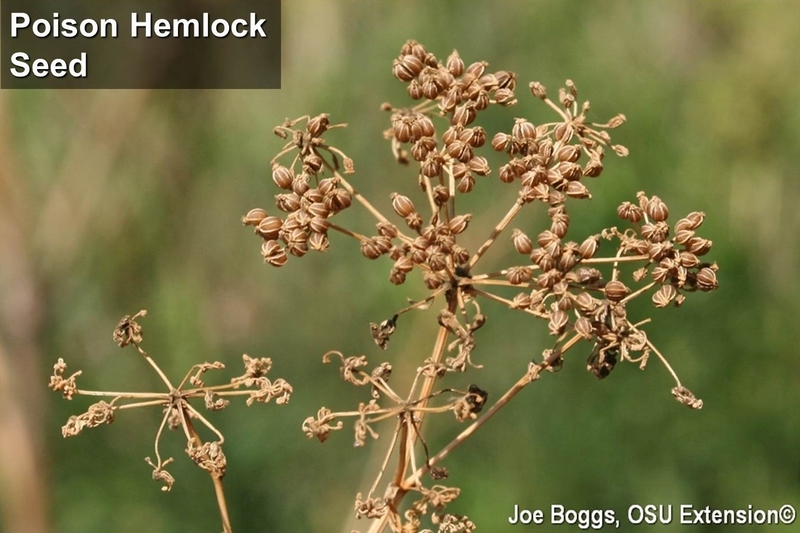 Poison hemlock is a biennial weed: the first year is spent as a basal rosette and the second year as an erect, towering flowering plant that can measure 6-10' tall. It is a prolific seed producer. Flowering plants are now turning brown with the seed is rapidly maturing in southern Ohio. This mean management options are limited. The dying plants aren't susceptible to herbicides and mowing or tilling will not destroy the seed. At this point, the best option is to wait until spring and target the basal rosettes as well as new plants from the current seed crop with selective or non-selective post-emergent herbicides including glyphosate (e.g. Roundup). On an interesting side note, while photographing poison hemlock plants that are going to seed, I came across several plants heavily infested with aphids that had attracted a large population of Multicolored Asian Lady Beetles (MALB). I was surprised that the aphids and their predators were doing so well. I've tentatively identified the aphids as the Fennel Aphid (Hyadaphis foeniculi) which along with a few other species is capable of sucking sap from poison hemlock without going the way of Socrates. However, I remain surprised that MALB is able to chow-down on the aphids with immunity. Are the aphids rapidly detoxifying the hemlock sap? Are they only showing up when hemlock plants are dying and possibly less toxic? Perhaps all will be revealed if we heed Socrates' last words and sacrifice a rooster to Asclepius.